The seemingly simple question of what governs the shapes of river channels has been a longstanding challenge for geologists and civil engineers. 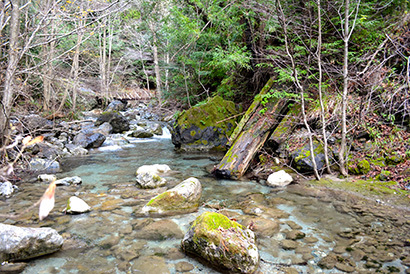 A new study led by scientists at UC Santa Cruz shows that the amount of sediment a river transports is a key factor in determining river channel geometry and the size of the sediment grains on the riverbed. The findings, published March 13 in the Proceedings of the National Academy of Sciences, undermine a common assumption about gravel-bedded rivers. The idea, supported by decades of observations, is that gravel-bedded rivers reach an equilibrium, called a threshold channel, where the median-sized grains on the riverbed only start to move when the channel is full (the "bankfull flow" stage, just short of flooding). "If all channels are threshold channels, that's convenient because it helps us make predictions for management decisions and for modeling landscape evolution," said first author Allison Pfeiffer, a doctoral candidate in Earth and planetary sciences at UC Santa Cruz. But Pfeiffer found that the assumption does not hold for rivers in regions with high erosion rates leading to large amounts of sediment moving through the river channels. These conditions are common in the steep, tectonically active landscapes found along the West Coast of North America. When Pfeiffer analyzed data on channel geometries and erosion rates for gravel-bedded rivers throughout North America, she found most of the rivers that violate the threshold assumption are on the West Coast. 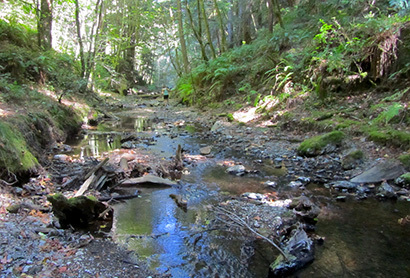 "Rivers in steep landscapes like the Santa Cruz Mountains transport lots of sediment compared to rivers in, say, Michigan or upstate New York," Pfeiffer said. "These rivers with high sediment supplies have adjusted their geometry to transport sediments at more moderate flows, so it doesn't take a flood event to move a lot of sediment." As a result, the sediment on the riverbed is much finer than would be predicted by the threshold channel model. Coauthor Noah Finnegan, associate professor of Earth and planetary sciences at UC Santa Cruz, explained that threshold channels may only develop in settings where a low sediment supply allows the smaller grains to be swept away and not replaced. Left behind is a layer of "armoring" on the riverbed consisting of larger grains that might only move at the highest flow rates. "West Coast rivers tend to have a less well-developed armor layer," Finnegan said. "If you change the sediment supply, the quickest thing to adjust will be the grain size in the armor layer." When he and his students take measurements in local rivers, he said, the results typically do not conform to the threshold channel paradigm. 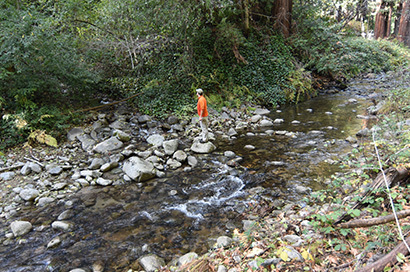 Pfeiffer encountered this in the course of a project to predict the distribution of salmon spawning habitat in the Santa Cruz Mountains. Salmon need gravel in a certain size range to build their nests. Using the threshold assumption, Pfeiffer's predictions of gravel size were off by a factor of three. "That can be a huge difference for a Coho salmon," she said. "Now we know that the sediment supply is a key factor that has to be taken into consideration if we're trying to predict salmon habitat." The findings may also have practical implications for the design of river restoration projects. Rivers are self-forming systems, and their channels form and reform with every flood event. Efforts to impose human designs on them are not always successful. "Rivers are tricky puzzles that continue to bring us new challenges," Pfeiffer said. "The importance of the sediment supply has perhaps gone underappreciated. We don't yet have the kind of theoretical model of river channels that we'd like to have, but this study shows that the sediment supply is a variable that has to be included in the model." Coauthor Jane Willenbring, a geologist at UC San Diego, contributed the data on erosion rates. Pfeiffer's research was supported by a grant from the ARCS Foundation.